In 1951 the Department of Works and Housing introduced a new suite of standard office furniture for Commonwealth Government offices. Its design seemingly covered every possible issue, from the glare of light reflecting off the desks to the wear and tear on public servants’ clothes. No more shiny bums with this range of furniture – the Department has thought of everything! 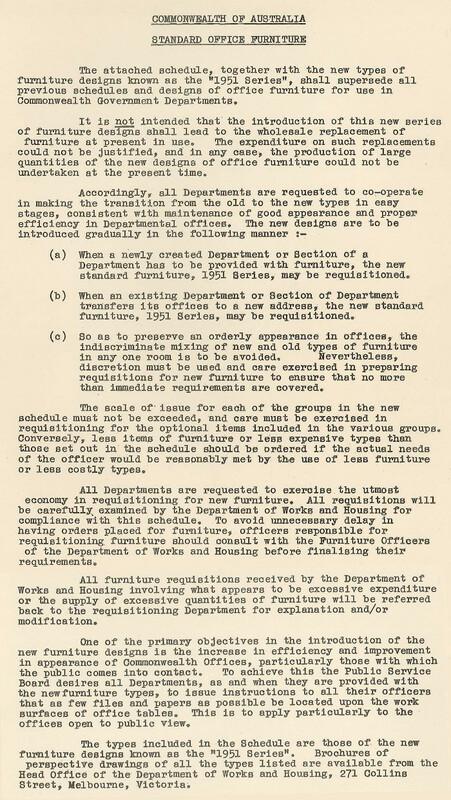 The published schedule of ‘Standard Office Furniture – 1951 Series’ is ArchivesACT’s Find of the Month. The new line of furniture was designed with "visible timber surfaces ... to be dull polished in a light maple colour" which was selected to reduce eye-strain and eliminate scratching that might result from a polished table top. 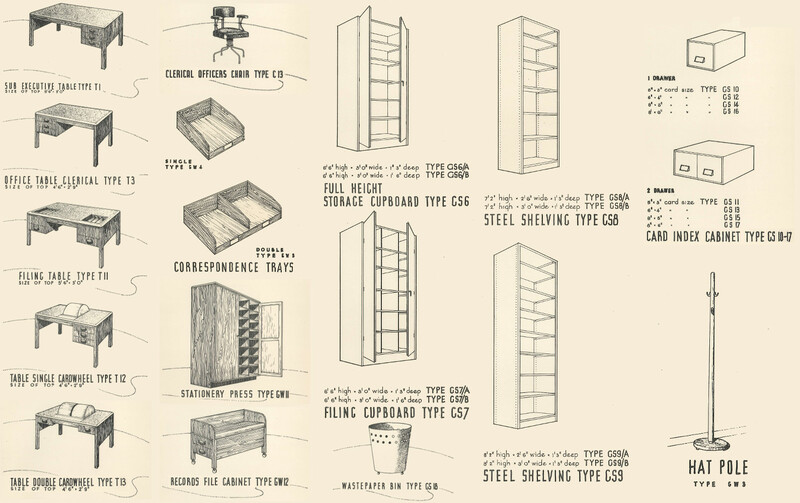 A range of tubular steel furniture was introduced "so as to conserve the rapidly dwindling supplies of furniture timbers for the more important furniture", and was particularly recommended for offices in tropical areas. Only senior staff could have leather chairs. The rest made do with "leather cloth... a heavy weight repp or uncut moquette which will give satisfactory service at less cost and at the same time causing less wear on officers' clothing." The different standards extended to more than just chairs. Only Ministers and First Division Officers could have wall to wall carpet. Junior ranks had linoleum, unless the Permanent Head of the Department was prepared to approve carpets "to cover not more than half the floor area" for staff in the Second Division, or Third Division staff earning more than £1490. Ministers’ secretaries could be approved to have floor rugs. Similar distinctions were made on who could have curtains and who made do with venetian or holland blinds. The public weren’t immune from this furnishings class system. Upholstered settees were available "for use in waiting rooms where elderly people such as old age pensioners are likely to be catered for." Others had to make do with a much less comfortable-looking timber bench chair. In all events, waiting rooms were to be "modestly equipped." The schedule cautioned sternly against wholesale replacement of perfectly good office furniture with the introduction of these careful new designs. Preference was to be given to newly created offices or departments and existing departments or sections moving to a new address. The Department of Works and Housing held, though, an equal horror of the "indiscriminate mixing of new and old types of furniture in any one room", and urged that "discretion must be used and care exercised." All requisitions were to be carefully examined by the Department of Works and Housing. The published furniture schedule suggested that the new furniture would increase the efficiency and improve the appearance of Commonwealth Offices. The Department of Works and Housing needed to produce furnishings that were attractive, efficient, cheap, hardwearing and less likely to produce shiny bottoms in its users. No mean feat at all. No wonder the new range lasted for six years.